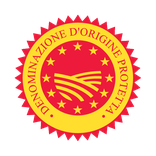 Prosciutto is the star of the PDO products of our territory. It is made only from fresh Italian pork thighs, as per the specification regulated by the Prosciutto di Parma Consortium. No preservatives, no additives, a low calorie food with high nutritional values. It is a food for everyone, that is easy to digest. Sea salt, and the microclimate of the Langhirano hills are the only ingredients used to make Prosciutto di Parma. It is not uncommon to see, on sunny winter days, the prosciutto factories with the windows open to let in the Marino, the wind that comes from the sea, to caress the prosciuttos that are curing as they rest. The fire branding of the five-pointed crown of the consortium occurs after 16 months of curing on the suitable products. The prosciutto that TastyParma selects and offers you has been cured at least 24 months, an artisan process that is completely carried out by hand in its delicate phases. The Prosciutto di Parma, the sweet one in its maximum expression. How to Keep Prosciutto di Parma fresh .